Or maybe for your gay best friend? 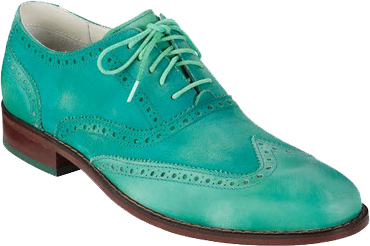 I don't often write about men's fashion, but I pass these candy-colored oxfords by Cole Haan nearly everyday on my two-block walk from my office to the Bar Method studio where I work out. It's a treacherous walk, full of temptations: Intermix, Cynthia Rowley, All Saints and (worst of all) a brand new Rag & Bone outpost. But I digress. It's the Cole Haan window that has been drawing my eye for the past few weeks. Sure, there's a women's version of the oxford, but there's something so fresh about a man's shoe with some color. I just wish the men in my life could share in my excitement. My boyfriend would never go for these, nor would my dad. But they would be just perfect for a certain local Twitter phenom! Bostonians, can you guess who I'm talking about? wow- they are really cool. i love the idea of two colours in one shoe. screw my boyfriend! I want these for myself! I love these beautiful colours. I know a few straight Euro guys who would wear these... the turquoise one at least. I'm kinda in love with the two tone! 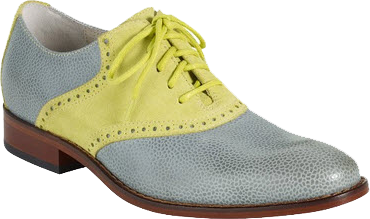 I am a huge fan of men's shoes, especially oxfords. Hmm.. 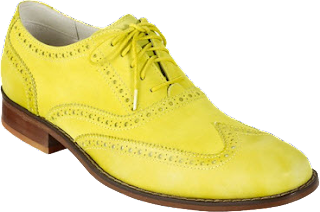 I wonder if I could convince hubby to rock a bright pair like this! 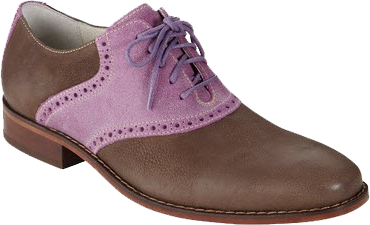 I love these oxfords! The yellow and teal ones are my favorite- such happy colors! Did I mention how much I love the new blog look? If not, I have been meaning to do so!! And I love what Cole Haan has been doing in mens shows- picked up a great pair for husband....which he has yet to wear, but wear them he will (I am determined!!). My husband would never wear them, but I would! These are fabulous! Thanks, Lani! And I'm so glad you got these for your hubby. I love them!